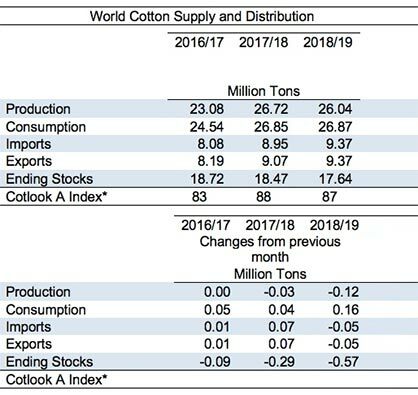 Global cotton consumption is projected to post its third straight year of growth — but just barely, with an expected increase of only 0.04%. Vietnam — 3%, down from seven straight seasons of double-digit growth. After posting 15% growth in 2017/18, China is expected to see its consumption growth slow by 8%. On the other end of the spectrum are Turkey, Indonesia and Uzbekistan, all of which are projected to increase their consumption by double digits. India is expected to expand its mill-use as well, although by only 1%. The future of US-China trade tariffs remains uncertain, and while they might soon be lifted, they might also be increased. That lack of clarity is making it difficult for growers in the Northern Hemisphere to make their planting decisions for the coming season.